Published FREE each weekday during the school year. Paid membership for educators and students gives you searchable archives of hundreds of Minutes with their corresponding Transfer to Teaching classroom suggestions for each Minute. Visit the iNK Think Tank company website to meet all the iNK Thinkers and access our FREE database of iNK authors' books aligned with standards for curricula and grade levels. The Nonfiction Minute Cast of Characters! 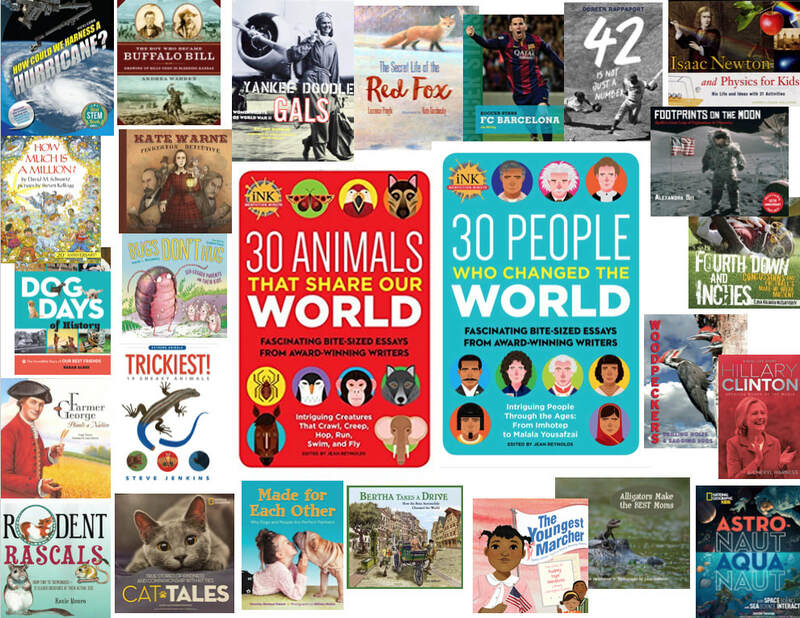 covering education, the environment, social justice, science, interesting nonfiction for kids (book reviews) & more. Janus Adams, Jan Adkins, Sarah Albee, Mary Kay Carson, Vicki Cobb, Sneed B. Collard III, Cheryl Harness, Kerrie Logan Hollihan, Steve Jenkins, Cynthia Levinson, Trish Marx, Carla Killough McCafferty, Heather Montgomery, Marissa Moss, Roxie Munro, Amy Nathan, Aline Alexander Newman, Dorothy Hinshaw Patent, Laurence Pringle, Doreen Rappaport, David M. Schwartz, Stephen Swinburne, Alexandra Siy, Jennifer Swanson, Peggy Thomas, Laurie Ann Thompson, Andrea Warren, and Jim Whiting. ​For a complete list of all of iNK's award-winning authors with their stellar credentials check out the iNK Thinkers page. Just a few of the iNK authors' recent award-winning titles!